Background: I had approached Hannah about telling me about her family Passover tradition that she had fleetingly mentioned at Shabbat Dinner at Hillel at the University of Southern California. She had talked about a hazelnut game for children during Passover that is unique to her family. Hannah goes to her grandparent’s house for the first night of Passover and celebrates the second night at her great-aunts house. She is from Illinois. Context: I interviewed Hannah in the dining room of our sorority house, Delta Delta Delta. It was right after dinnertime so the dining room was full of people with coffee or tea chatting in the background of our conversation. Reflection: I am Jewish and grew up in Los Angeles going to Jewish day school. I have never heard of a tradition like this one, from my friends or family. Background: I had approached Hannah about telling me about her family Passover tradition that she had fleetingly mentioned at Shabbat Dinner at Hillel at the University of Southern California. She had talked about a hazelnut game for children during Passover that is unique to her family. Hannah goes to her grandparent’s house for the first night of Passover and celebrates the second night at her great-aunt’s house. She is from Illinois. Context: I interviewed Hannah in the dining room of our sorority house, Delta Delta Delta. It was right after dinner so the dining room was full of people with coffee or tea chatting in the background of our conversation. After Hannah shared her family tradition of the hazelnut game (published under the title “The Cremer Family’s Passover Hazelnut Game”) I asked her if her family has any other family traditions for Passover. She then shared the tradition of individual afikomen. “Mang-tae-gi-hal-a-buh-ji will come kidnap disobedient children!” (말 안 듣는 아이는 망태기 할아버지가 잡으러 온다!) is a phrase that makes all Korean children shiver in fear. Mang-tae-gi-hal-a-buh-ji means grandpa (hal-a-buh-ji) of net bag (mang-tae-gi). 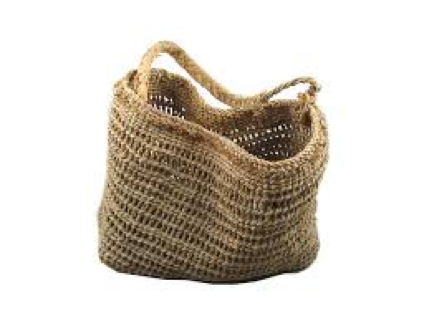 The net bag was widely used during the pre-modern times and is made from weaving hay together like a net, making a tightly knit bag for carrying goods such as crops. There are stories of the Mang-tae-gi-hal-a-buh-ji kidnapping children either to scold them and return them back, never let them return or cannibalizing on them. It is commonly thought that the origin of the Mang-tae-gi-hal-a-buh-ji is of old men that were leprous carrying the Mang-tae-gi bag. There was a belief of being able to be cured of leprosy through boiling and eating a child. I collected this from my mother, who has numerously used the name of Mang-tae-gi-hal-a-buh-ji in the past in order to get me to become more obedient. This is significant to my mother has herself has also been subjected to this superstition by her own mother. My grandmother, despite being a devout catholic woman, made sure to track all superstitions to keep my then unborn twin cousins safe from harm. One of them involved giving the yet to be born child no pre-birth name (태명/ Tae-myeong) or intentionally giving them a very bad pre-birth name. This was because of the superstition of when one gives a good pre-birth names to children, evil spirits that are around, including Mang-tae-gi-hal-a-buh-ji, will try to inflict harm on the good child. By downplaying the child through a bad pre-birth name, one is able to avoid the attention from these unwanted evil spirits. My twin cousins were given pre-birth names of Ddol-ddol-I (똘똘이) which means someone that is somewhat bright. Not the worst, but not good enough for evil spirits I guess. Mang-tae-gi-hal-a-buh-ji can be compared to the Boogeyman, another mythical creature that is used to frighten children into good behavior. By instilling fear of disobeying, the parents can control the child much easier. However, despite using the name of Mang-tae-gi-hal-a-buh-ji to scare children, the parents themselves also take caution against the evil spirit by taken on traditions such as giving no pre-birth names or bad pre-birth names. The three year mountain pass (삼년고개/ sam-nyeon-go-gae) is a traditional Korean folk tale. I collected this from my high school friend who lives in Shanghai, China. Despite living abroad, I was amazed when I went over to his house because his bookshelf was filled with Korean children’s folktales. He stated in the interview that because he moved abroad to Shanghai at a young age of three, his parents feared that he would lose to ability to speak Korean or not be able to identify renowned traditional stories. So his father made sure to always buy books when he traveled back to Korea for business and carry them back in suitcases. Because he is the youngest child from both the maternal and paternal side of the family, he states that he has no younger cousins to give the books to so he plans to make sure his children read the same books as he did. This story is significant to only only my friend, but to many people that attended Korean pre-school, kindergarten or elementary school, as the three-year mountain pass is one of the first stories children learn. The tale of the three-year mountain pass, promotes thinking outside of box. If it was not for the grandson looking at the problem from a different angle, the grandfather would have passed away due to being fixated on the thought of only having three-years left in his life. It can also be interpreted to think simple, as the simple mind process of the child was what was able to save the grandfather. Additional interesting factors are that this is a tale that is intended for children but it is a story of a child saving the day, despite the lack of knowledge and wisdom. It can have a moral to parents of not completely disregarding the children’s input on a situation, as well as showing kids that its okay to have courage to say what they believe is right to their parents. On a final note, the story also has themes of worrying about impending doom, as the grandfather lies ill for the three years. The story gives a moral of not wasting times worrying about the impending doom as although the grandfather laid ill for three years, there was no information about the three years, implying that they all went to waste due to there being no relevant information during the three years, other than the fact that he was ill, to show that the grandfather did nothing significant for years due worrying about a factor that he thought he could not influence. Informant is a first year acting student at the University of Southern California. She was born in Medellin, Colombia, grew up in the San Francisco Bay Area, and at age 12 she moved to Paris and later Hong Kong. She spends her winter and summer vacations with her family in Colombia. I asked the informant about how she celebrates Christmas, and this was her response. When asked how she celebrates Christmas, the informant shared that in her family, the belief is that baby Jesus himself brings you one present, typically the biggest one you asked for, and he leaves it underneath your bed. She still said Santa brings other presents, but the biggest one comes from Jesus. Unlike the typical belief that Santa Claus comes through the chimney and delivers all the presents under the tree, the informant added onto this and said that for her family in Colombia, baby Jesus himself is responsible for bringing the biggest or most important presents. Santa is still responsible for bringing other gifts (see also “Celebrating Christmas on December 24th”), but her family wanted to emphasize the fact that Christmas is a celebration of the birth of Jesus by having him bring the present that they most looked forward to. Christmas seems to get more and more commercialized each year, and this addition is a simple reminder of what the holiday is about at its core. Informant is a first year student at the University of Southern California who grew up in Seattle, Washington. She learned this song at elementary school as a child. The informant was telling me that she had a song from her childhood stuck in her head all day. I asked her which one she was referring to, and she then sang this. This song was such a familiar piece of the informant’s childhood, and seemingly everyone who grew up around her also knew it. Additionally, some of the informant’s friends who did not grow up anywhere near Seattle knew this song, with maybe some slight variations, and even those who did not know this specific song had their own version with a similar rhyme scheme or tune.